This entry was posted in Hunger & Poverty, News & Views and tagged caring, compassion., Conserative, differences, experience, liberal on March 30, 2018 by Ray Buchanan. 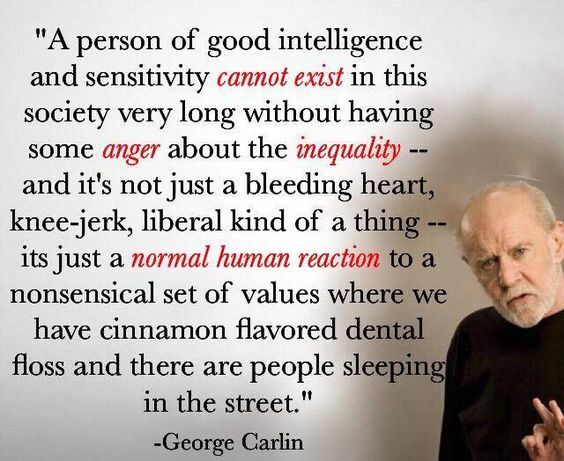 This entry was posted in Hunger & Poverty, Quotes and tagged anger, bleeding heart, George Carlin, homeless, hunger, inequality, intelligence, liberal, nonsensical values, poverty, rich, sensitivity, wealth on July 2, 2017 by Ray Buchanan. This morning’s gospel reading is from the 11th chapter of Matthew. John the Baptist is in Herod’s dungeon. When he hears of what Jesus was doing, he sends his followers to ask him if he (Jesus), is the Messiah. The answer Jesus gives to John’s followers is both simple and direct. There’s no mistaking the actions, or the values, of Jesus. Look around you. The ones you see doing the works, and living the values of Jesus, are those who demonstrate an authentic Christian spirituality. 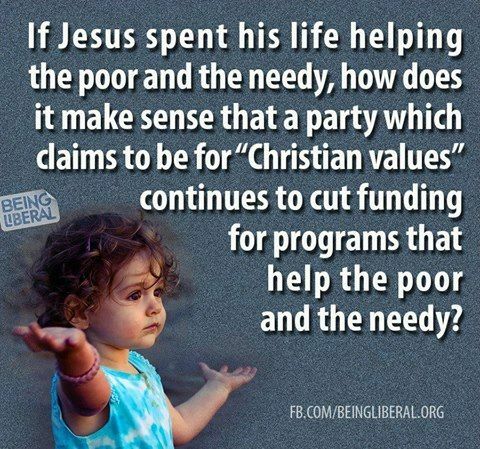 You can see “Christian values.” They are centered on helping those most in need. This entry was posted in Hunger & Poverty, News & Views, Spirituality & Religious Writings and tagged authentic spirituality, blind, caring, Christian values, compassion., cutting funding, deaf, gospel, Gospel of Matthew, hungry, Jesus, lepers, liberal, lifestyle, love, needy, poor, preaching, Republicans on December 11, 2016 by Ray Buchanan.